I never used to love long plane or car rides until I started knitting. When I traveled to my brother’s wedding in Australia in 2008, the 20-plus hour journey (which was fortunately broken up over two days after our flight to LA was delayed because of bad weather) seemed interminable — even after watching all of Gone With the Wind and Out of Africa. Going back two years ago, I was kind of amazed at how short it felt. Really. I watched all of Season 1 of Downton Abbey and a knit a decent amount of the Biscuit Shawl for my Ravelry swap partner. 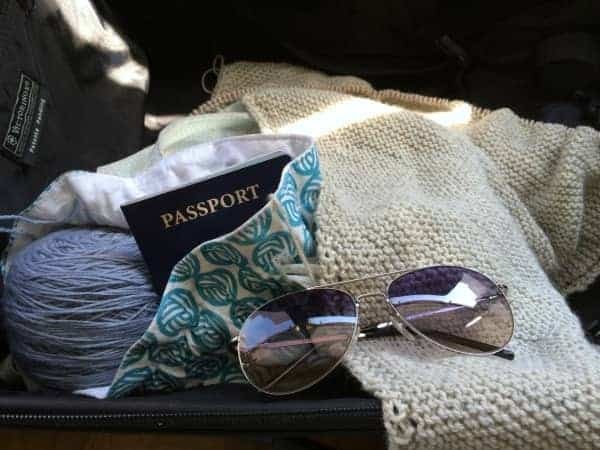 Of course, one of the nicest things about travel knitting, aside from taking your mind off “Are we there yet?”, is that whichever project you choose becomes infused with memories of your trip. The Cladonia I recently finished makes me think of Florida, and how the stripes matched the colors of my bathing suit perfectly (completely by accident, as I received both skeins in last year’s Indie Untangled summer swap). I knit much of the top of my Waterlily during the car ride to and from the Astral Bath open house last June. So, which project will I end up associating with vaporetto rides and Gaeta olive oil? What are your favorite travel knits? Which of your projects do you associate with memorable trips? Comment and let me know. This entry was posted in Uncategorized and tagged knitting, patterns, shawls.